The restaurants of America—especially those of the fast-food variety—have come under attack for, among other things, making portion sizes much too large. This, nutritionists say, is one of the main causes of obesity. But I think the biggest problem with large portions is that they make it that much harder for patrons to leave room for dessert. I believe deeply in dessert, and few things cause me as much grief as arriving at the end of a meal only to discover I’m so full that I couldn’t possibly consider even one wafer-thin mint. A sad state of affairs indeed. Being the sort of snob I am when it comes to French food, I have a special fondness for dishes—especially desserts—that are decadent, inventive, and spelled with an excessive number of accent marks. I can’t think of any dessert that fits that description better than crème brûlée. All things being equal, I usually prefer desserts that have a high chocolate content, but I do make occasional exceptions. What crème brûlée lacks in chocolate it makes up for in fat, calories, and general impressiveness. Crème brûlée (literally “burnt cream”) begins its short life as a custard—a sweetened mixture of cream and egg yolks that’s heated until it thickens. It’s then usually poured into shallow, single-serving ceramic dishes called ramekins and chilled until it becomes firm. But unlike similar custard dishes such as flan and crème caramel, crème brûlée undergoes an extra finishing step. The top surface is sprinkled with sugar and then subjected to intense heat for a few seconds to caramelize it, thus forming a thin, crispy crust. 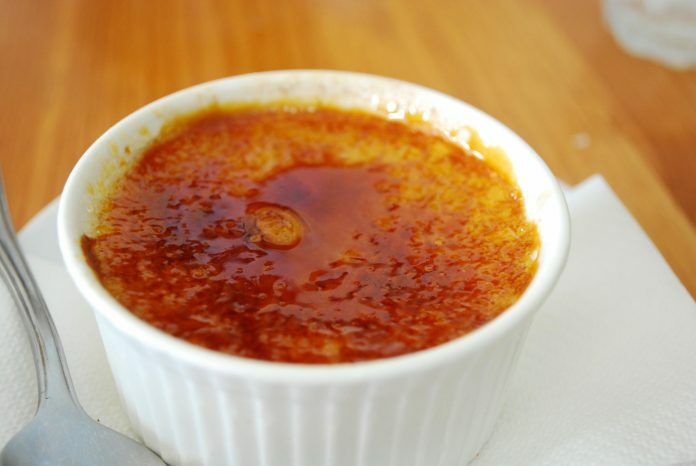 Although it is possible to use a broiler as the source of heat, the results tend to be uneven, and the inside of the crème brûlée often warms up, which is not the desired effect. So professional chefs typically use a blowtorch to melt the sugar, creating a nicely browned surface. Another approach requires a tool called a salamander, which consists of a heavy metal disk attached to a long handle. After heating the disk over a burner, you place it on (or just above) the sugar to caramelize it. What makes a crème brûlée’s crust special, though, is not just its appearance but its sound. When I hear the distinctive “snap” of a spoon breaking through the crust of a well-made crème brûlée to reveal the creamy goodness underneath, I always smile and sigh as though I’ve witnessed something magical. If Bernard Pivot (or James Lipton) asked me what sound or noise I love, that would be the first thing I’d think of. It’s just one of those things. If you happen to have a conventional propane torch lying around your workshop, that will do just fine for crème brûlée, as long as you’re careful to use properly heat- and flame-resistant dishes. But most crème brûlée enthusiasts prefer a more compact (and less scary-looking) butane kitchen torch, which can be found at respectable cooking stores for about US$40. That may seem like a costly tool for just a single recipe, but it can be used to add a finishing touch to many kinds of desserts, not to mention searing tuna steaks and defrosting your freezer. And it’s a small price to pay to impress your friends. As for my chocolate obsession, there’s nothing to say I can’t have my crème and eat it too: people can and do sometimes make chocolate crème brûlée. I’ve also had some excellent lavender crème brûlée, and I’ve seen recipes for many other flavors—including pumpkin and ginger. But although I don’t consider myself a purist, I must admit that the simple and elegant combination of eggs, cream, sugar, and vanilla works best for me. Now if you’ll excuse me, I’ve got to go burn my dessert. Note: This is an updated version of an article that originally appeared on Interesting Thing of the Day on September 17, 2003, and again in a slightly revised form on July 29, 2004.